Oh my God, you’re joking! Self-Portrait? I don’t do me! I go on the other side of the camera, it is the closet I carry around with me! Plus, in my nerdy state of affairs, I struggled with the concept of just what is a self-portrait – a portrait of the self, taken by any one, or a portrait of the self taken by the self? This is not what I should be spending time obsessing about, not at this time of year with Christmas so soon and my preparations to date non-existent. . .
Having posted so many photos of others I am hardly in a position to object to showing something of my face, although I could quietly sit this week out, what with Christmas and everything, but, I found this from the archives – a snap shot taken in a photo-booth with friends. Years ago but what the heck and when I really stop to think about it, it doesn’t seem that long ago. What I have done with the shot is dress it up in some feathers and glitz so that in the event I do see out my days in a nursing home I will be the little old lady over in the corner with the crazy hat, lipstick and jewellery. Whoever has the time to come and visit will see the face of a little old lady looking at them. Behind the lines, however, this is the person who will be thrilled to see them! Heck, I might even take up smoking again by then! haha I know the feeling. I hate being in front of the camera. They are two such different zones of comfort, aren’ they! Thanks for the camaraderie! She sounds like one to watch! Thank you Jake, it was a rather confronting theme this week! Oh my goodness Jake, this is so kind of you! Touched and honoured, thank you! Thanks Harry, for the comment! As for the nursing home, hoping to have that one in the way distant future! If I looked like that I would be Queen! For the nursing home I recommend additional glitz and bling, it works for me! Wow, let’s all be Queens! Amazing how a little extra glitz and bling go a long way. Thank goodness! I have the same reaction. I don’t do myself either. I dread taking my own photograph thus I’m still thinking of ideas for the challenge. Love your photo. Impressive, futuristic, warm and happy smile . Perfect for the holidays. Wishing you a The best of the holiday season!!! It was a tough one this week and I am glad/sorry to hear your thoughts! It is easy enough to take a SP with a smart phone, computer camera etc but the look always comes out the same – staring down as though you are talking to someone on Skype, or someone on a dating site. So I played around with this one, hoping to hide the face perhaps a little more than I managed to do. Plus, it is the festive season so I decided to have some fun with it. Can’t wait to see what you come up with! All best! That is a delightful and creative photo. Love it! Thank you Alan! I raided the dress up box! Yes, it is such a strange feeling but all a matter of comfort zones. I remember that as a child, most of the photos were so staged and cheesy, too much hard work and very little fun in the process. But, that was film and it was rather expensive etc. Happy snapping and keep those great shots coming! Loved the way you worked with the theme! Great picture! A most confronting challenge this week to say the least! Thanks Josette for your company! i hear you well – i am behind the camera lens most days as well. that makes me part of the image i am capturing. Kris, this is wonderful and I love the concept that your vision is reflected in the image! I dislike having my picture taken, and even on this challenge i am shying away from the photos where I can see what people look like. Isobel, I thoroughly agree with you and very much appreciate your comment. Thank you. Thinking about the very nature of what is challenging, and this indeed was one of the more challenging and confronting, (plus I have not been backwards in coming forwards with shots of other people,) I felt I had to put my own neck on the line. But I was going to have some fun with it! Love the feathers and glitz approach! If we happen to wind up as little old ladies in the same nursing home, maybe we can borrow each other’s clothes, crazy hats and jewellery. It would double our wardrobe creativity. Merry Christmas! Bluebee, thank you so much!!! Thank you Margie, wasn’t quite sure what to do with this week’s challenge . . . Thank you privatemixture for the pingback! Hi Patti, Been glad about your photo I didn’t know much about how you look-like but this one seems so gorgeous enough for me to like it so much…Merry Xmas to you..
And a very Merry Christmas to you John! Thank you so much for your very kind and generous comment, am blushing . 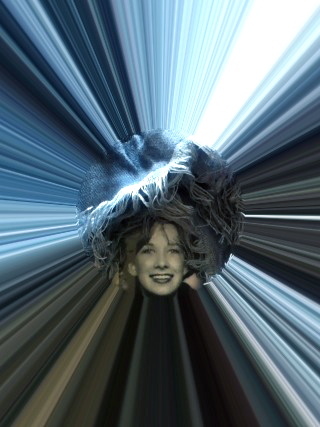 . .
Who knew there was so much fun to be had with an iPhone app! A little razzle dazzle goes a long way! Now Kool does bring back memories, thanks Cheryl – and for the pingback! A very creative self portrait – super cool! Time travelling with the help of CamWow! Thank you Pie. This is one creative entry! Cool! Thank you so much Nelson! Sweet of you to say, thank you Gilly! I like the thought, rather than the reality, of being a naughty old lady puffing away! Thank you melonpopzdropz for the pingback. Fabulous name you have there! One challenge a week and you’re doing great! I love your portrait 🙂 Thank you for the share! Thank you Pierre, happy to share. Love all your wonderful adventures! Very creative self-portrait! : ) I think most of us that spend a good deal of our time taking pictures would rather be behind the camera as opposed to in front of it. and too easy to let this challenge slip away . . . loved your stunning collection! Whoa! You look like the almighty and powerful Oz. Hmmm, happy to go with the almighty and powerful but if we are talking Oz, and the wicked witch of, well then my family would agree with you! Thank you for the ping back and off to explore some of your mirth and motivation! Arindam, thank you so much! Thank you and Happy 2012 to you and your growing family! How fun! And a great one for the nursing home. My partner, Bashert says she’s going to be the one with the dyed red hair, blue eye shadow and dangling earrings. You let Bashert know I look fwd to her company! In the meantime, thank you for yours here and Happy New Year, and fun times, to you both!!! Interesting interpretation of the theme. I like it very much. Thank you Isadora! It was such a tough one, for me, that I thought the only way around it was to have some fun with it!